Join the discussion on our forums! Come discuss Halazzi, the Lynx over in our dedicated Halazzi, the Lynx discussion topic. If only this card itself had rush. That would have been hella cool and amazing. Though yeah maybe you would have to tweak some stats here and there but yeah this guy with rush filling your hand with rush would be very much playable. And quite flavorful. Eh... "playable," sure, but not "very good" and definitely not "meta-defining". It has synergy with a bunch of Hunter cards, but a stronger card imho usually has the merit to stand on its own without necessary card synergies. You put this in your deck, you have to build around it, like Mecha'thun or Rhok'delar except with much less payoff. I love Scavenging Hyena synergies, believe me, but part of what makes it work with Hunting Mastiff is that you aren't telegraphing your hand to your opponent before you execute your strategy- you can play Hyena and Mastiff together on a single turn between 6 and 10 and clear a few enemy minions while buffing your minion to 6/4, 8/5, or 10/6. 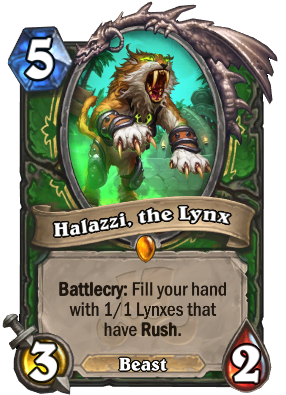 Halazzi the Lynx generally doesn't have that advantage- you toss it out, your opponent instantly knows the brunt of your hand, and the limited number of techniques you can do with it. You have to have Toxmonger or Spirit of the Lynx or Stampede to make this card work, because no one thinks a hand full of 1/1s with rush on turn 6 is good by itself. It can work, but it just feels a bit restrictive and clunky for my taste, outside of Quest Hunter which instantly telegraphs itself at the start of game anyway and thus has nothing to lose. This card can be discovered by Deathstalker Rexxar's craft a zombeast hero power , just to let you guys know. It can win you game. I'm missing this card and Houndmaster Shaw , for a deck i really need ! I hope i open some packs and get useless legendary so i can dust to craft those cards i really need. Been playing this in a beast midrange Hunter and it's not bad at all. The 1/1s rush combo well with Scavenging Hyena. got halazzi, what am i supposed to do with? Great synergy with Hunter's Mark, The Marsh Queen, Scavenging Hyena, Toxmonger, and Wing Blast. Best use I see is the obvious Quest Hunter. Someone posted a "core" here that I used to build this deck. After having played with this card during the pre-release, I'm convinced its pretty good as a 1-of in some kind of hunter deck, making the legendary rarity fitting. This is not something you really want to draw and play on turn 5, but I found that when it gave me 8-9 rush minions later on in the game, my chances of winning skyrocketed. It's especially good when you're slightly behind or at parity with your opponent. Being able to use the rush minions as extremely flexible removal was very handy, especially if I had Leok on the board. A lot of criticism is levied against the card being a poor turn 5 play, but that's not really what you want to do with this card. This is a really good card - and you don't need to put it in some gimmicky combo or quest deck to make it good. It's just fine the way it is. I'm sitting at about 4 stars out of 5 right now. solid assessement! I had this card played against me and it definately helped my opponent get the win. I want this card just because of the art. At first I thought that this added Springpaws to your hand. That crap would be Tavern Brawl levels of stupid. Still a solid card, though. this looks super good for a number of synergies, including quest. omg nobody has said this but this card would be absolutly crazy with tuxmonger!!!!! kill 3 minions for 7 mana or simply clear the word with 10. 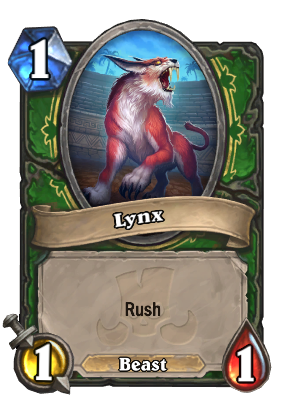 I didn't see the reveal video, but when I saw the card I misread it as "Fill your board with 1/1 lynxes that have rush", I about fell out of my chair.